Good weather and school holidays or weekends are an ideal chance to dust off your bikes, pump up your tyres and go for a ride. Bikes and kids go together, usually with huge smiles of exuberance and joy. It’s hard to beat the sense of fun, freedom and adventure that we feel when riding a bike. It’s a great way to show your kids how to stay active and healthy, and creates more vibrant and connected communities. This is something you can do with your kids, and once you are set with bikes and helmets it is good, free fun. So, grab your bikes and enjoy fun family time, get outside, explore new places and boost your health. Whether you are heading off on a big adventure or cycling around your neighbourhood, here are ten key ingredients for creating fun and safe biking memories. It is important that you have bikes that are suitable for your size. Although it is tempting to put kids on a large bike that they will grow into, the most important consideration is safety. A child on a bike that is too large may not be properly in control and more likely to come unstuck. For both adults and kids, the right size and set up is essential to safety and comfort. Your local bike shop can help advise on size. The second-hand marketplace is a great option for moving through the bike size range for your kids. It is advisable to get any second hand bike safety checked by your bike shop. Before each ride check your tyres and brakes, and make sure your helmet is on your head and fitting well. Fun Kids struggle with mind over matter, and sometimes need some help so they don’t get caught up in ‘this is too hard’ thinking. We’ve found singing songs together works for my daughter, and for my son, storytelling works magic. Now he is older he tells the stories, and our ears get more worn out that our legs! Our friends turn their bike ride into a computer game, complete with characters, levels, points and challenges. And few kids will turn down the opportunity to race their parent and win! Humour Bringing your family sense of humour along is essential. Things don’t always go according to plan and it will help if you can relax and laugh about it. What a great life lesson! In New Zealand we are lucky to have biking trails in places of great historical interest, natural beauty and interesting attractions. This is where you can remind yourself it is about the journey not the destination. Stop and explore, see the world through a child’s eyes. Read the signs, play ‘Pooh sticks’ off the bridge, ride through the tunnel a few extra times, explore side tracks. Ride quietly for a time and listen to/spot the wildlife. Talk about what you are seeing, hear their ideas about the world. Tell family stories. Connect to the place you are in. Strategies Remember they are kids. As kids they have a lot going on in their bodies and minds (like growing!) and some days will be tougher than others. Your primary goal is to have fun, so go with the flow and adjust your plans as needed. Choose small adventures to begin with – the dairy or the local park may do nicely. If possible save the downhills for the way home, and try for a tailwind on the homeward leg. And never underestimate the power of a hug and some empathy, because, yes! you know this is tough for them. Manners Chances are, you will not be the only people out using your route. Walkers, farmers, livestock and other people on bikes are all likely to be out there too. So here is a brilliant chance as parents to teach your kids about manners, courtesy, sharing, treating others with respect, returning and giving friendly greetings, engaging in conversations with others, dog-safety, leaving gates as you find them (open/closed), respecting fences and boundaries and of course, taking your rubbish with you. Teach your kids how to ride safely. Mostly, riding safely means riding predictably, with awareness and control. So no cutting across others, swerving or suddenly slamming on the brakes. Know how to hold your line (not swerving around the place). Call out when you are passing someone (a friendly hello will usually do, although you can try “passing”). Ensure you are visible. Avoid headphones. Be confident in handling your bike in tighter spots and varying surfaces. Have a bell on your bike to warn other trail users. Carry a mobile phone so you can call for help. Arrange regrouping points if your group is splitting up, and ensure everyone rides within eyeshot and earshot of at least one other person. Speaking from experience here, it is important to have some skills and experience for riding safely on the type of surface you will be on. Loose surface riding requires different skills and awareness than riding on a sealed path. You need to know how to brake and steer smoothly and to avoid the deeper areas of loose gravel where you will have less traction. Cycle skills training is available for all ages around the country. Gear On short rides you won’t need much more than a bike and a helmet. On longer rides, along with food and water, you may wish to think about carrying: spare tubes, pumps, puncture kits, tyre levers, rain jackets and a basic first aid kit. You Chances are your kids love you! They want to be with you and look to you to be their example. Here is a chance to tick all those boxes and create some amazing family memories and tales to tell. Take photos. Chill out. Be the coach, the mentor, the entertainer, and the cheer-squad, but most of all, be there. Ignore your phone and forget your to-do list for a while. These moments won’t come again. Food & Drink Kids’ fuel tanks empty faster than ours. Make sure they’re well fed when you head out for a ride. On longer rides, carry water and snacks so you can refuel. Active kids need very frequent snack breaks, more than you might think. Make sure food is nutritious and a good source of lasting energy. Think like you are feeding an Olympic athlete. Sandwiches, bananas, muesli bars, apples, and crackers are great. On longer rides include some lovely treats like biscuits, lollies and ice cream as some extra motivation when energy levels drop. Make sure you have lots of water to drink. And since this is not a race or training session you won’t need sports drinks. 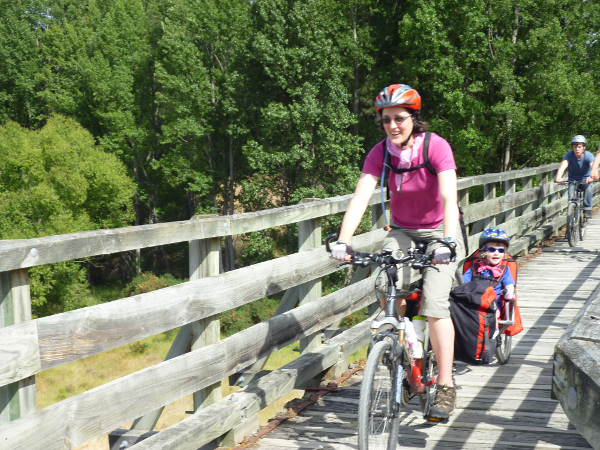 Jo Clendon, aka ‘The Cycling Mum’ encourages more families to use their bikes via her blog www.cyclingwithkids.co.nz. She spoke at the 2WALKandCYCLE conference in Auckland. Whether your bike ride is a trip to the dairy or a multi-day adventure, she’s happy to answer your family biking questions, provide information and inspiration.